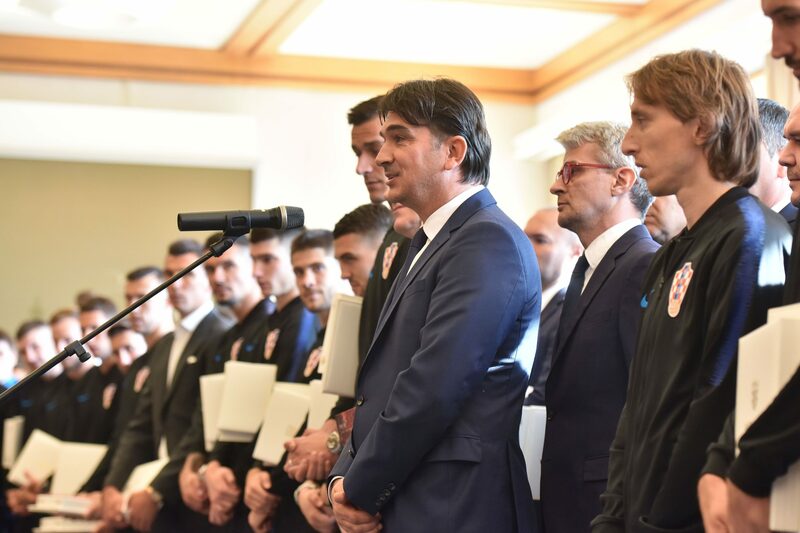 The president of Croatia, Kolinda Grabar-Kitarović, has hosted Zlatko Dalić, Luka Modrić and the rest of the successful Croatian football team on Tuesday in Zagreb. President Grabar-Kitarović awarded the Order of Duke Trpimir with Neck Badge and Morning Star to coach Zlatko Dalić and federation president Davor Šuker for their performance at the recent World Cup in Russia. The Order of Duke Trpimir ranks fifth in the Croatian order of precedence and is awarded for merit in contributing to the independence, integrity and international reputation of the Republic of Croatia. “You won the hearts of the world. Thank you for achieving this historic success, but above all that you brought back smiles and unity. Thank you for showing the entire world how it is the nicest to be a Croat, that there is no better feeling than that. Thank you for playing for all Croatians in the homeland and outside of Croatia. Thank you for bringing back identity and making us more proud,” the president said before awarding the Orders. The team was awarded the Order of Prince Branimir with Ribbon, whilst the support staff who were part of the Croatian team at the 2018 World Cup were awarded the Order of the Croatian Star with the Effigy of Franjo Bučar, Order of the Croatian Trefoil and the Order of the Croatian Interlace. Coach Zlatko Dalić addressed the president on behalf of the team. “Thank you for your presence in Russia it gave us the support. Croatia was the most beautiful country in the world for a month and it should remain that way. We showed unity, fight and humility. We will continue to give our best in each game to promote Croatia and make Croats in the homeland, in Bosnia and Herzegovina and throughout the world happy and proud of us,” Dalić said. Last night the side held their first training session in Zagreb ahead of Thursday night’s clash against Spain with Luka Modrić, Ivan Rakitić sitting out the session. “I am expecting a full stadium, good play, and three points so that at Wembley it will be decided who wins the group. Unfortunately, Pivarić is out injured, as is Barišić, Sosa, Strinić, and Leovac and there will be problems at left back. I am not sure who will fill that gap,” Dalić said ahead of the training. Last night the team were visited by Croatian Generals who presented them with awards for their efforts in Russia. The match kicks against Spain off on Thursday at Maksimir stadium at 8:45 pm. Croatia will then head to London to face England at Wembley on Sunday at 3 pm local time.